Don’t you wish that you had a magic formula for marketing your small business? So do I … I have not found it yet but what I found is a successful marketing formula that you can use in your small business. Example of a marketing goal: Become the industry leader in the Miami market. Objectives are shorter term, they explain what needs to happen and be achieved in order to meet the goals. They should be Specific, Measurable, Attainable, Relevant and Time-bound (SMART). When writing your objectives start with action verbs such as: Increase, Produce, Grow, Improve, Gain, Acquire. Example of a marketing objective: Increase sales revenue by 30% by the end of the year. Your marketing goals and objectives should be aligned with your business mission statement (why are you in business?) and positioning (your target market and your Unique Selling Proposition). 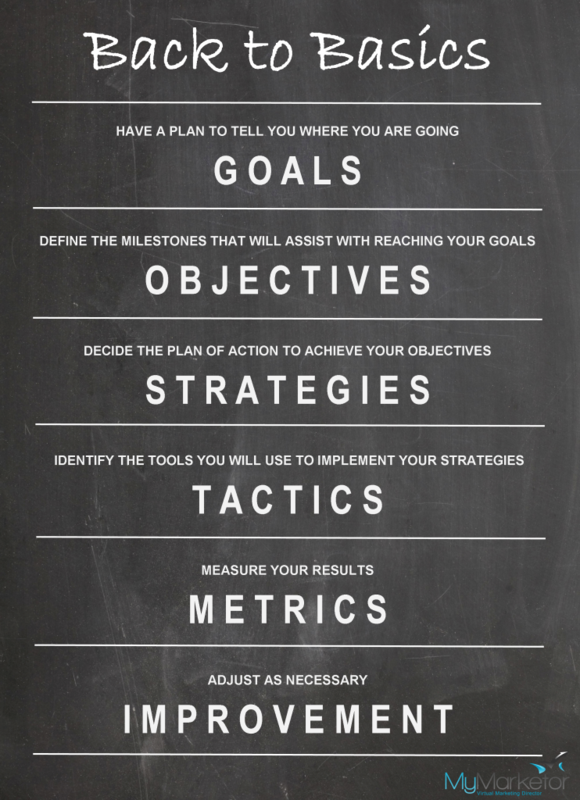 Once you have written your objectives, you then develop your strategy or set of strategies to meet each objective. When writing your strategies start with action verbs such as: Develop, Create, Designate. Example of a marketing strategy: Develop a product or service that will solve our new target audience’s problem. Tactics are what you do to help implement the strategies, achieve objectives and attain goals. It’s the detail work. For every strategy, there are a number of tactics. When writing your tactics start with verbs such as: Utilize, Add, Contact, Participate, Implement. Example of a marketing tactic: Participate in the XYZ industry trade show. Marketing strategies and tactics set your business apart and give you a competitive edge. They should be easy to understand so that they can be implemented by your staff. A good way to track your marketing efforts is to ask your clients/customers how they heard about you. But not everything you do in marketing can be measured in terms of dollars. Social Media: number of followers/subscribers/users and interaction such as retweets, likes, shares, or repins. Measuring your marketing efforts on regular basis will help you identify positive (or negative) trends, assess what is working and what is not, and make improvements. As you refine your strategies and tactics you will develop your own “magic” marketing formula to reach your target audience(s). Finding time for regular and consistent marketing can be difficult because there is always other “business stuff” that takes priority. MyMarketor can help you reach your marketing goals! CONTACT US today and let’s grow your business!